I got impatient on this one, and now I'm not happy with it. Should have nailed down the background more before I started in on the peppers. But the peppers were the fun part, so I jumped the gun. And then trying to paint around them to make something of the background wasn't happening. I even cropped out the top of the painting because it's just more brown confusion. Maybe I'll fix it up later. Or I'll just title it "Peppers with poorly defined bowl and brown void". 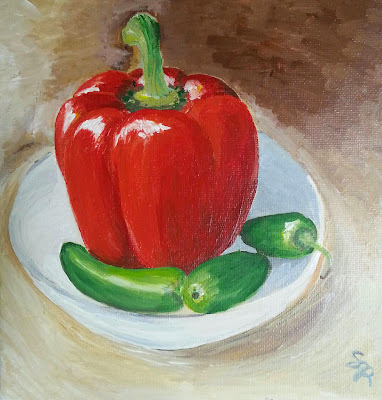 It's a shame - I think this painting would be decent had I spent 5 more minutes pre-pepper. I'm a little excited about how this one turned out. 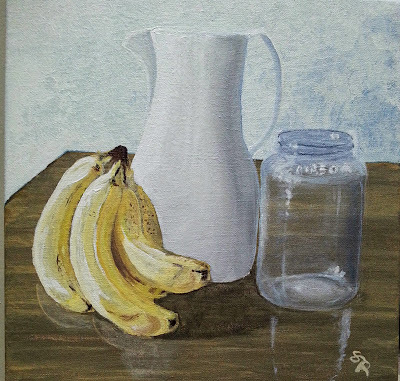 We've got a pitcher with some nice shadow effects, we've got a shiny clean mason jar, we've got some bananas that are starting to turn, and it's all reflecting ever so slightly on the glossy wooden countertop. Yesterday's still life turned out pretty good, so I was motivated to try another one. I staged this scene and then tried to be careful and methodical instead of my beloved fast frenzy style. I actually waited between layers to let things dry. It's weird, I'll have a little stretch where I think I can't paint anymore because everything turns out terrible. And then all of a sudden I'll have some good ones. Hopefully I'm learning or developing some skills. Not muddling all my colors together actually makes things look brighter. Oh! Shadows and shading really take a painting from flat to "good". Huh! If I give a little effort, instead of throwing paint around like a cat batting at a yarn ball - I like my paintings better. Hmm. 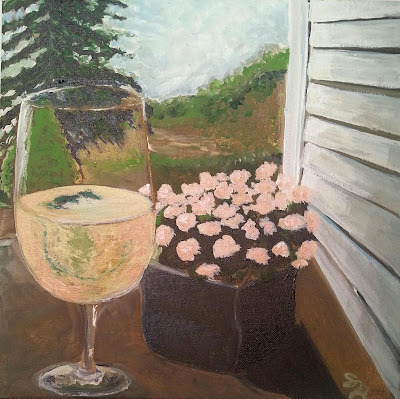 Here we have a nice big glass of pinot grigio and a container of begonias. It's a common scene at our house on a hot summer evening. A balmy night with some jasmine wafting in the breeze, a cold drink, and some katydid sounds... that's the good stuff. It could be better, but I'm done with it. The more I look at it, the more I like it. I think I'll do some more still lifes. 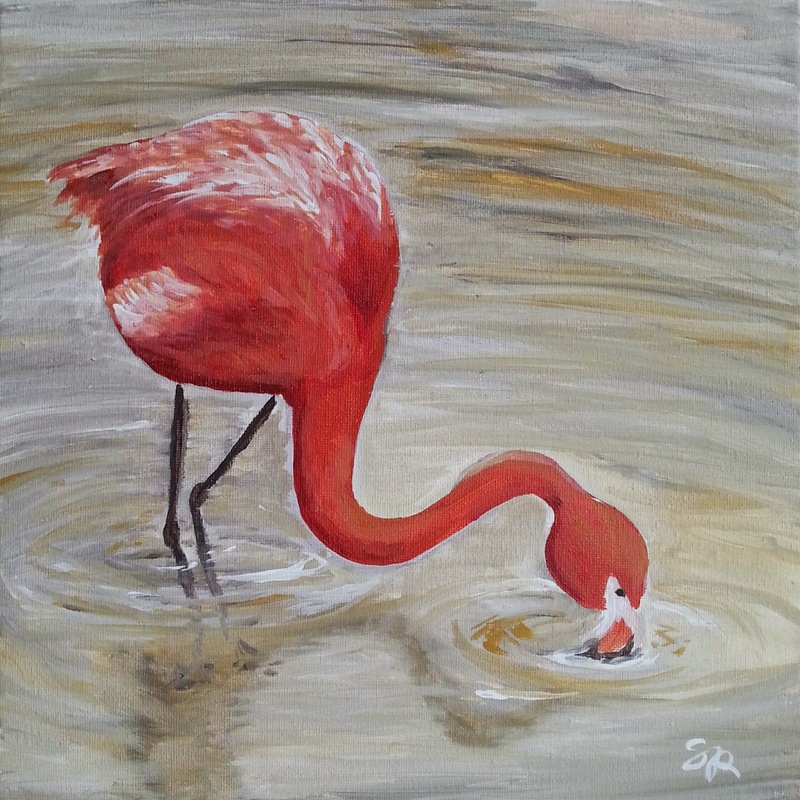 And now for a break from the animal paintings. A landscape! 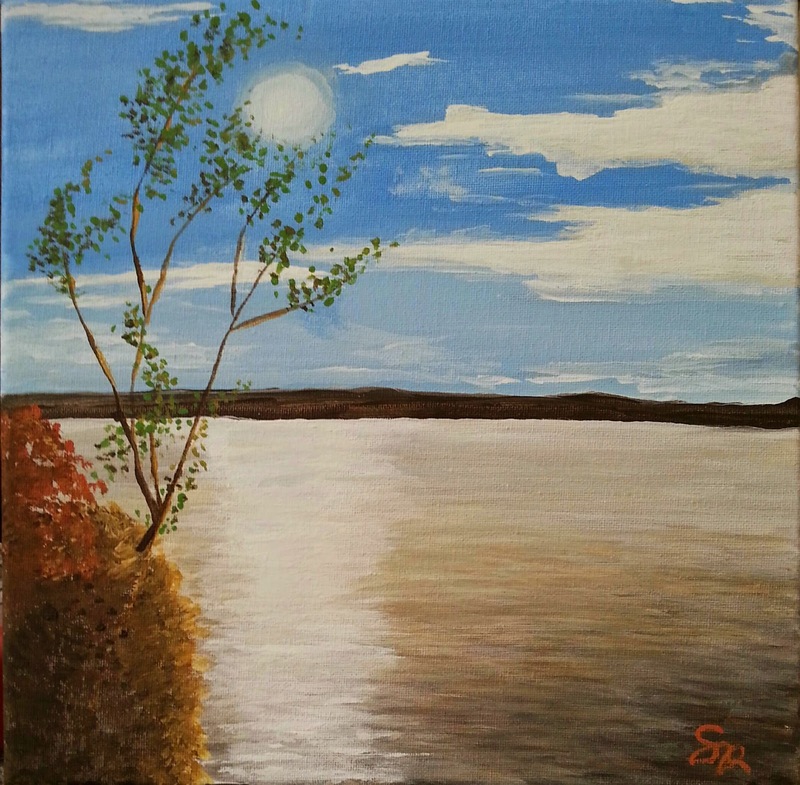 I can't say I'm super excited about this painting I just did of Hoover Reservoir. After two hours, I just got bored with it, so it is what it is. Good enough. I figure if I just keep painting, even when I'm not "feeling it", there's bound to be a good one every so often. Maybe I'll love the next one. We found a website that lists a ton of them. Some of the obscure ones are really cute. Like, a prickle of porcupines. Or army of caterpillars. Parliament of owls. (owls got the funk) Honestly, I think someone made some of them up. A shrewdness of apes? Come on now, no one's gonna say that. I'm making up "cuddle of cats". I think that sounds better than glorying (?? weird). For flamingos, it's a flamboyance. Or a stand. 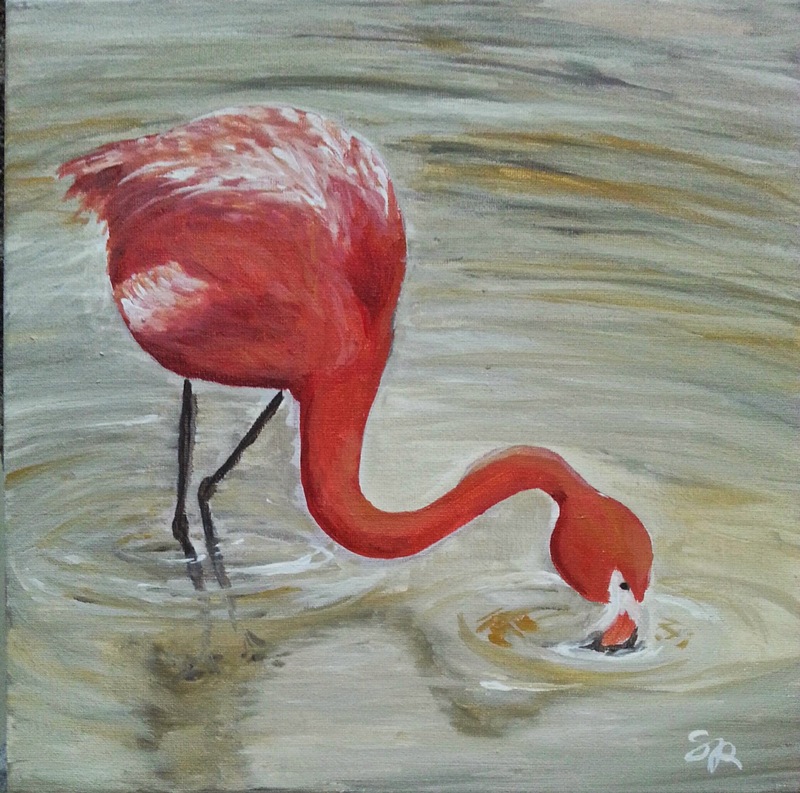 I don't have a whole flamboyance painted, but please to enjoy this solitary flamingo.